AccountAbility’s Managing Partner, Simon Zadek, launched this report at the Boao Forum this year in Hainan and at the China Entrepreneur Club’s Daonong Green Companies Forum in Beijing. This paper is part of a two-year study with the State Council’s Development Research Center on “China’s sustainable trade strategy” working with several central-level Chinese research organizations and three international think tanks. This paper examines how the Chinese business community can best use international sustainability standards to enhance their competitiveness in global markets and more effectively place themselves on a sustainable economic pathway. It highlights the opportunity for Chinese businesses, supported by enabling public policies, to become a force in shaping the next generation of sustainability standards in global markets as a competitive strategy consistent with China’s broader interests. Doing so will require deeper engagement in existing standards initiatives, and a more explicit role amongst the communities that have developed and now govern them. Effective engagement in such standards is a means of off-setting competitive disadvantages, and creating competitive advantages when businesses and nations choose a more sustainable development path. This paper sets out both strategic options for businesses and policy options for the Chinese government to realise sustainable development and competitiveness goals. Download the full English version, full Chinese version, or the bilingual executive summary. Download the full English version. Download the full Mandarin version. Download the bi-lingual Executive Summary. AccountAbility DRC _ China Sustainable Trade Strategy_Press Release_Chinese and English the press release. Mentioned in the Harvard Business Review blog here. Video interview with me on NetEase discussing link between sustainability and Chinese competitiveness (in Mandarin Chinese). 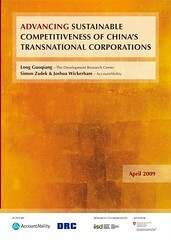 This entry is filed under China, competitiveness, development, publications, standards, sustainability. You can follow any responses to this entry through RSS 2.0. You can leave a response, or trackback from your own site.